"I have suffered from major depression for most of my 44 years. About 11 years it reached a point that I sought therapy. I then had to take a leave of absence from teaching because I didn't want it to affect my students. As I continued to slide downhill, I ended up going on disability. I took classes to prepare for another line of work and completed the requirements, but by that time the depression was so bad that I was being hospitalized and had begun receiving shock treatments. 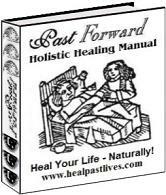 Through the next 10 years I continued with western medicine but I also began exploring areas of eastern medicine. I had tried acupuncture and pressure, energy healing and balancing, tai chi, prayer, diet, herbs, and many other areas. Through several of the energy balancing sessions I began to find peace within that provided me with some sense of calmness in dealing with the pain that doesn't seem to leave. During several of the sessions, I had started to experience past life regressions, without realizing at first what they were. After several times, one of the healers explained to me what was happening. I had been through several sessions, when another healer suggested that I use Ellen's services. Our first session was so interesting because of gut "feelings" she vocalized for me, reinforcements that have occurred since she introduced me to some of my former selves. I find that I have a better understanding of myself, and that I am better able to deal with situations that have previously caused me a lot of turmoil and panic, simply by taking a moment and listening to my guides and my "gut." A lot of the pain has been alleviated by my letting go of those past lives. I realize I still have a lot to learn in this life, but I am far more open to it now that I have let the past stay in the past so that I may deal with the present and move on to the future. There is still depression, and I don't know where that will end or if it does, but I am dealing with it. And I am dealing with life on a different basis now. I feel as if I am making more progress now, toward my future, rather than toward my past. Ellen, you are a true blessing to me. Thank you from the bottom of my heart and wrapped with my tears of joy.